With Valentine's Day just around the corner, many of you are looking for a quick Valentine's themed sew. I found the perfect quick sew for my oldest daughter in the Perfect Ten top with a small heart shaped accent pocket! This particular top is perfect for my finicky 8 year old who really is only interested in wearing something comfortable that meets her definition of stylish. The Perfect Ten also pairs well with the Cambridge Skinnies as shown here! Here are a few of the many options available for the Perfect Ten top! Not only are there loads of options available to make the Perfect Ten perfectly suited to whatever style you choose, there are a few other pattern features that should be mentioned. The Perfect Ten top sews up super quickly. We used the Heart Pocket embellishment to give this top a festive feel for Valentine's Day. Woven cotton was used for the pocket in a color that coordinated with the red floral brushed polyester used for the top. 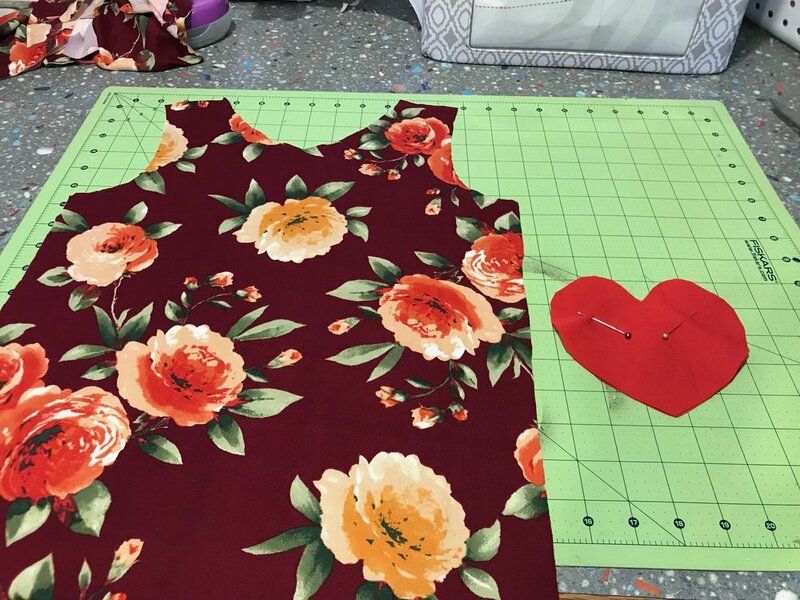 The pocket was Perfect finishing touch for our Valentine's themed Perfect Ten! I look forward to seeing many of you sewing up a festive Perfect Ten for the upcoming holiday!